The drought is finally over. Kyron McMaster ran a controlled race for the first half, began making his move after 250m, then left the field in his wake to lead a Caribbean sweep of medals in the 21st Commonwealth Games 400-meters hurdles last Thursday night in Gold Coast,Australia, when he stopped the clock with a winning time of 48.25 seconds. It was territory’s first medal in its 28-year history of competing in the games. At the end of the race, McMaster walked over, hugged his agent Norman Peart, grabbed the BVI flag, then bent down and let out his pent up emotions in memory of his late coach Dag Samuels who guided his development, before perishing in Hurricane Irma last September. In just his second race of the season, McMaster’s 48.25 seconds time improved his own world leading mark of 48.78 seconds that he used to advance to the final and paced the Bahamas’ Jeffery Gibson and Jamaica’s Jaheel Hyde to the finish line for the coveted Caribbean sweep. It was the first time that McMaster was in competition without his coach Dag Samuels who guided him from his early development including a CAC Age Group Championships medal in 2009. 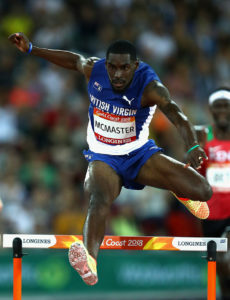 McMaster’s historic performance came on a night that three other BVI athletes were competing and saw a total of two other advancing to finals tomorrow. Five athletes advanced to finals overall—a first for the territory—and another two were in the semifinals, since track and field competition began on Sunday. Chantel Malone placed fifth in the women’s long jump final with a season’s best leap of 6.48-meters (21’3”), after a fourth place showing in Glasgow four years ago. Tynelle Gumbs was ninth in the women’s discus throw with a season opening mark of 47.04 meters (154’4”) after placing seventh in the Hammer Throw with a personal best of 60.97m (200’0¾”) a new national and OECS record. Twin sister Trevia, competing in the women’s shot put final, didn’t record a legal measurement. She used a 14.03m (46’0¼”) throw in the shot put, for her finals berth, where she ended the season with a season’s best 14.12m (46’4”) to finish 12th and wrapped up the territory’s participation in the games. Despite fouling two of three throws, Eldred Henry used a season’s best 50.43m (165’5½”) in the men’s discus throw to advance to the final. He improved to a season’s best 50.96m (167’2¼), where finished eleventh in the final. 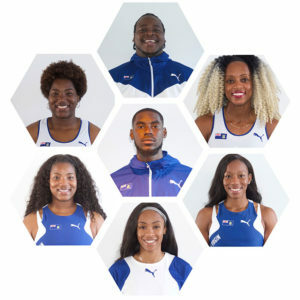 Five of the eight athletes including McMaster—Malone—long jump; twin sisters Tynelle and Trevia Gumbs—hammer throw and shot put respectively and Eldred Henry—both shot put and discus throw, were all finalist, the BVI’s best showing, while Tahesia Harrigan-Scott and Ashley Kelly were 100m and 400m semifinalists. The BVI first participated the Commonwealth Games in Auckland, New Zealand, in 1990.